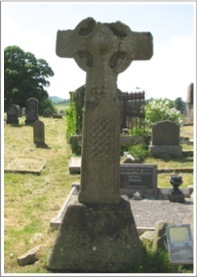 This page explores the High Crosses of County Tyrone. They include: Arboe, Caledon, Clogher, Donaghmore, Errigal Keerogue and Killoan. Where information is available there is a section on the history of the site, brief information about the primary saint related to the site and a description of the cross or crosses at the site. Except where noted, the photographs were taken by the author. 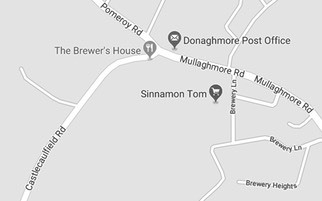 Directions to the sites reference The Official Road Atlas Ireland. Maps related to the sites are cropped from Google Maps. 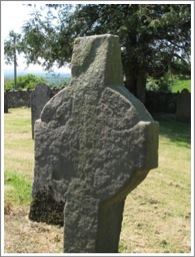 This feature includes an Introduction to the Site and the Saint and an Overview of the Cross. 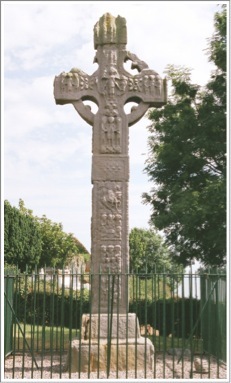 The photo to the right shows the east face of the cross. Basic information about the monastery at Arboe (also spelled Ardboe) can be found in a letter from William Reeves, the Rector at Tynan in County Armagh to a C. Treanor at Ardboe. The letter is dated 30 November 1869. 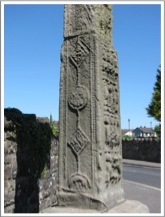 “My Dear Sir, I myself made a pilgrimage many years ago to the old Cross of Ardboe, when I was fresh in the incumbency of Ballymena, ere my tastes had broken out in a love for antiquities. “I copy all that is said about it in Archdale’s Monasticon. 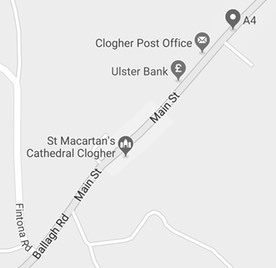 “‘In the Barony of Dungannon, and two miles west of Lough Neagh, a noble celebrated monastery was founded here by St. Colman, the son of Aid, and surnamed Macaidhe; his reliques were being preserved in the Abbey, and Festival is kept on the 21st February. “‘A.D. 1105. Monchad O’Flarthican, Dean of this Abbey, and a doctor high in esteem for his wisdom and learning, died in pilgrimage in Armagh. 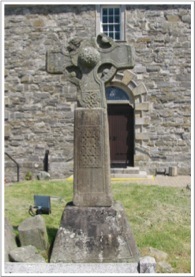 The photo to the left shows the west face of the cross. The lovely photo below, taken by Kenneth Allen, was found on the internet. Attribution is below in the References section. This shows the east side of the site with the ruins of an old church to the right and a view of Loch Neagh to the left. 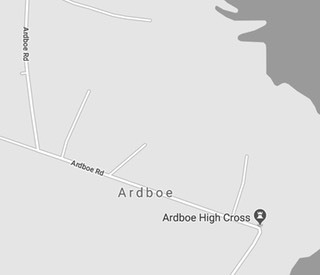 Legend tells us that Arboe was founded by a Saint Colman. However, there are at least 130 saints named Colman mentioned in the Irish Martyrologies and Histories. The Colman who is celebrated at Ardboe, as founder of the monastery there, has been identified with Saint Colman, surnamed Mucaidhe. A genealogy identifies him as son of Aid, son to Amalgad, son of Muredach, son to Carthenn, son of Erc, son to Ethac or Eochod, son of Colla Huasius, King of Ireland. 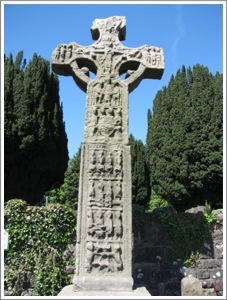 (omniumsanctorumhiberniae.blogspot.com) This follows the genealogy offered by the Parish of Ardboe website in claiming Colman was related to the royal family of his clan. The Carthenn mentioned above would appear to be the same person the Parish website names as Cairthen Beg. 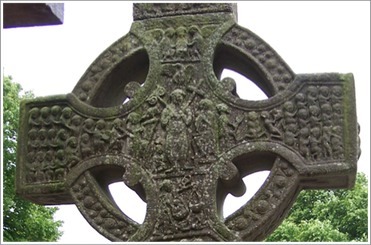 It is well known that many of the saints of Ireland had connections to royal families. Colman was apparently a member of this group. The cross at Arboe stands 5.70 meters or just over 18 and a half feet tall. It is one of the tallest in Ireland. It stands on a stepped base. Taken together the two levels of the base are 3 and a half feet tall. 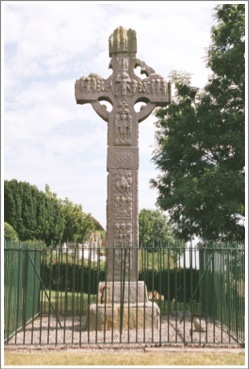 The cross is constructed of four pieces of red sandstone. Colonel William Stewart of Killymoon was born in 1781 and died in late 1850. He was a Colonel in the Tyrone militia and served in the Dublin and Westminster parliaments for Tyrone. He and his family were members of the Protestant Acendency. 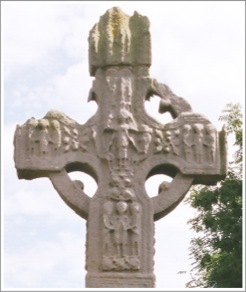 The upper parts of the cross are quite weathered. For our purposes the cross can roughly be divided into four parts. 1) the shaft, 2) a wider band of decoration near the top of the shaft, 3) the head above the band and 4) the house or church shaped cap. In the scene the tree stands between them and arches over their heads. 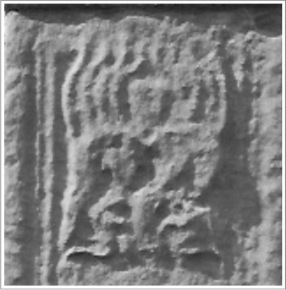 On the trunk of the tree the serpent is visible and is turned toward the left hand figure, presumably Eve. Both Adam and Eve have their hands lowered to cover their genitalia. Roe describes the angel in the upper right of the scene as “thrust[ing] in the ram.” (Roe, p. 82) Between their two descriptions we have a reminder of just how difficult it is, even for those who have studied the crosses most deeply, to discern the details of the image. This is more difficult on a sandstone cross like Arboe that has suffered so much deterioration from weather. The figure of Daniel is in the center of the panel. He seems to be clothed to the knees and to have an overgarment that comes to below the waist. Roe also describes him as having “a heavy mustache and short beard.” (Roe, p. 82) His hands are stretched out to the sides so that he has a kind of cruciform shape. His posture is best understood as an orant posture. Following is part of what the Encyclopedia Britannica has to say about this posture. It is clear from the text of Daniel that deliverance was a major theme of this story. When Daniel is initially placed in the lion’s den, Darius the king says “may your God, whom you faithfully serve, deliver you!” (6:16b) When Darius returns in the morning he calls out “ Daniel, servant of the living God, has your God whom you faithfully serve been able to deliver you from the lions?” (6:20b) Daniel replies that angels have protected him. On either side of Daniel is a lion raised up on hind legs, tail twisting around its legs, facing Daniel with its jaws open and its tongue reaching out toward Daniel. Bigger and Fennell, writing in 1897, are the lone voices suggesting another, but unlikely, interpretation of the panel. 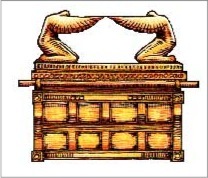 They describe it as an image of the Ark of the Covenant being carried along. They do not offer a detailed analysis of the image and that makes it problematic to assess their interpretation. The story of the Fiery Furnace follows the themes of the Sacrifice of Isaac and Daniel in the Lion’s Den better than the Ark of the Covenant. The head of the cross begins with a panel just above the band that has proved to be difficult to identify with any precision. Both Roe and Harbison agree on the content of the scene. At the top, in the center, is a bust of Christ. He is identified by the crook in his left hand. On each side of this figure are the busts of angels. Below are eleven figures, identified as the eleven apostles (the twelve minus Judas). See the photo to the left. If this represents a specific text, what text might that be? The only one that seems to come close to fitting is that of a resurrection appearance. In Matthew we read “but the eleven disciples went into Galilee, to the mountain where Jesus as directed them. When they saw him, they worshipped him; but some doubted.” (Matthew 28:16) Jesus then gives his disciples the Great Commission. The eleven surviving apostles and Jesus are accounted for in this scene. The angels accompanying Jesus are not mentioned in scripture but are typically present in high cross art depicting the crucifixion, for example. This interpretation bridges the interpretations of Bigger and Fennell and Roe by suggesting this is a resurrection appearance of Jesus with the apostles. The center and arms of the cross contain a scene identified as either Christ in Glory or the Last Judgment. As seen in the photo below left, the figure of Christ is in the center. He stands upright, clothed in a long robe, holding a cross in his left hand and perhaps a secptre in his right. He is surrounded by an indeterminate number of heads on his left and right and possibly above him. The head of the cross is badly eroded. Below the feet of Christ is an image of a scales. Below that are flames. These features suggest that the scene reflects the Last Judgment. 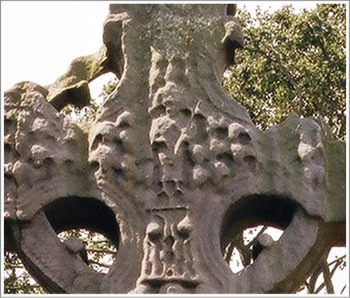 A similar, but more detailed scene appears on the head of Muiredach’s cross at Monasterboice in County Louth. In this image (below right) it is clear that the figures on the left are moving toward Christ while those on the right are moving away. They represent, respectively, the saved and damned. Whether this was true of the image at Arboe is not clear. 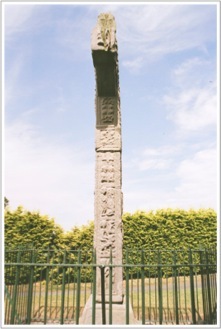 The Shaft: The following describes the decoration of the south side of the cross below the ring. The lowest panel represents Cain killing his brother Abel. The story is found in Genesis 4:1-16. Like the image of Adam and Eve on the east face of the cross, this image represents fallen humanity. 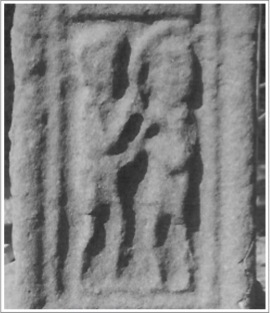 (The image to the right is a detail found in Harbison 1992, vol. 2, figure 34) In the image, Cain appears to kill Abel with a cleaver or machete type instrument. The next two panels, moving up the shaft, are closely related. They both come from the story of David and Goliath. The lower of the two shows David subduing a lion and rescuing a lamb. The text is found in I Samuel 17:32-37. This is a story David tells King Saul to convince him that he (David) is capable of subduing Goliath. 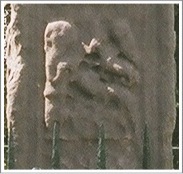 In the image we see the lion in the lower part of the panel with David to the left reaching down and grasping the jaws of the lion. 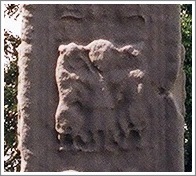 Above to the right is a lamb and there may be another lamb below the lion. Here we have two more images of deliverance. The fourth panel changes the theme away from the Hebrew scriptures to the tradition of the Desert Fathers, a popular theme for the churches of Ireland. It is relatively easy to pick out the figures of the two saints. They are seated side by side. Above there is a descending bird. What is more difficult to make out is that each of the saints has a staff with a crooked head that appears above their heads. Also difficult to make out clearly is that the bird carries a loaf of bread to the saints. 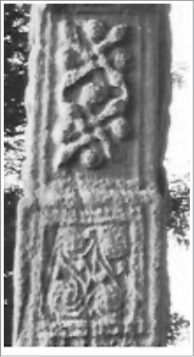 This image appears on a number of crosses, including the north cross at Castledermot. The band and the area above it are dedicated to decoration. Both panels feature bossed spiral design. That on the band is described by Roe as having “foliate links.” (Roe, p. 83) In this case the bosses are located in the four corners of the panel. In the panel above the band there are also four bosses. In this case they are located in such a way that in the center of the panel a cross is formed. Harbison suggests that above and below this cross form there are “what appear to be stylized animal forms.” (Harbison, 1992, p. 16) In the images available, it is difficult to make out the details of either of the panels. The entire west face of the cross, except for the band is dedicated to stories from the Gospels about Jesus. Beginning at the bottom and moving up we have the Adoration of the Magi, the miracle of the Wedding at Cana, the miracle of the Multiplication of Loaves and Fishes, the Triumphal Entry into Jerusalem, the Arrest of Jesus, and in the center of the head and on the arms, the Crucifixion. The Shaft: The lowest of the images represents the story of the Adoration of the Magi. There are five figures in the panel. Sitting and holding the baby Jesus is Mary. Above her head are two bosses. At least one of the bosses may represent the star that guided the Magi. The Magi appear, two on Mary’s left and one on her right. They carry their gifts in their hands. Matthew 2:1-11 offers the text for this story. It is the only one of the four gospels that relates a visit by the Magi. The image to the left is taken from Harbison, 1992, Vol. 2, figure 37. The second panel up represents the story of the Miracle at the Wedding at Cana of Galilee. The text is found in the Gospel of John 2:1-11. Helen Roe suggests we read it as a story in two acts, the first across the top of the panel, the second across the bottom. (Roe, p. 83) Read this way Jesus appears in the center of the upper frame. He is flanked by Mary on the left and the master of the feast on the right. Here we see Mary requesting that Jesus do something about the lack of wine. In the lower panel we have four figures, Jesus on the right faces three servants on the left. Along the very bottom of the frame are the six stone jars of water for the rite of purification. Jesus seems to hold a hand out and the servant nearest him may be taking water, now wine, from one of the jars at Jesus’ request. In John this is recorded as Jesus’ first miracle. The text tells us this revealed Jesus’ glory. The story appears only in the Gospel of John. Moving up the shaft we have the miracle of the Multiplication of Loaves and Fishes. All four gospels have a version of this story (see Matthew 14:13f , Mark 6:30f , Luke 9:10f and John 6:1f) . In Matthew the disciples declare that they have only five loaves and two fish. Mark and Luke follow a similar pattern. John is the only gospel to mention a young boy as the source of the loaves and fish. The next scene is intended to represent Jesus’ Triumphal Entry into Jerusalem. This is another text that appears in all four gospels: Matthew 21:1f, Mark 11:1f, Luke 19:28f and John 12:12f. In Matthew and John the animal Jesus rides is referred to as a donkey. In Mark and Luke it is referred to as a colt. In the image to the right the animal appears to be a fine and full grown horse. Porter accounts for this incongruity by suggesting this is actually a scene from the life of Saint Columcille, founder of the monastery at Iona. (Porter, p. 41) Favoring this point of view is the presence on the south side of the cross of a scene identified as the Raven bringing bread to Saints Anthony and Paul, an image from the lives of the saints. (See above.) Against this point of view is the fact that all the other scenes on the face of the cross are connected to the life of Jesus. The band: On the band at the top of the image to the right is a panel that includes a series of small bosses. The pattern is worn and indistinct. b) The Mocking or Flagellation of Jesus. This episode is reported in Matthew 27:26f and Mark 15:15f, following Jesus’ condemnation by Pilate; in Luke 22:63f while Jesus is in the home of the High Priest and before he appears before the Council; and in John 19:1-5 before Pilate condemns Jesus. c) The Ecce Homo. This refers to a statement made by Pilate as recorded in John 19:5 following the mocking and flogging of Jesus. In this version of the trial he is brought out draped in a purple robe and with the crown of thorns on his head. Regardless of the interpretation, the image is a reminder of the events in the gospels that led to the crucifixion of Jesus. The head of the cross is centered on the crucifixion. It is a classic image that contains Stephaton and Longinus on either side of the crucified Jesus and an angel on each shoulder. Stephaton on the right offers vinegar on a pole. Longinus on the left stabs Jesus near the armpit. In the constriction of each arm is a star shaped design with small bosses. On each arm are three figures. In each case a center figure is flanked on each side by what appears to be a soldier. The soldiers appear to beat the figure in the center. The most probable interpretation suggests these parallel scenes represent the thieves crucified with Jesus being beaten before being crucified. Above the crucifixion image there appear to be another three figures. The image is worn to such a degree that no reasonable interpretation is possible from the art itself. The shaft: The photo to the left is from Harbison 1992, Vol. 2, figure 40. The panels are identified as the Baptism of Jesus (bottom) and Christ before the Doctors (above). There are alternative interpretations of the upper panel. In the lower panel John the Baptist stands to the left. He is a towering figure and appears to hold a book in his hand. On the right is the much smaller figure of Jesus. The waters of the Jordan may be suggested at their feet. There is what probably was a dove above the head of Jesus. It is badly worn. The texts that describe Jesus’ baptism can be found in Matthew 3:13f and Mark 1:8f. The dove, as a symbol of the Holy Spirit, appears in both versions. The most logical interpretation of the upper panel is that it represents Jesus before the Doctors. The text here is found in Luke 2:42f. In this interpretation a young Jesus sits or kneels in the presence of two larger figures who represent the teachers in the Temple in Jerusalem. The photo to the right is from Harbison 1992, Vol. 2, figure 40. The prevailing interpretation of the lower panel is the Slaughter of the Innocents. The upper panel has been interpreted as the Judgment of Solomon, the Slaughter of the Innocents, the Annunciation to the Shepherds and a scene from the legends of Cuchulain. Bigger and Fennell, as with the upper panel above, offer an interpretation taken from the Hebrew Scriptures. This scene and the one above can be read together as reflecting the story of the Judgment of Solomon. This text is found in I Kings 3:16f. In the story two mothers argue over one child. The lower image could well reflect this scene. In this interpretation the upper panel represents Solomon ordering that the child be divided between the mothers. (Bigger and Fennell, p. 2) In their interpretation three of the four panels on the north side of the cross have themes taken from the Hebrew scriptures. Roe and Bigger and Fennell group the upper two panels together as part of one story. They identify entirely different stories, however. Porter offers a non-biblical interpretation of the upper panel. He sees this image as a reference to the hero of Irish folklore Cuchulain. 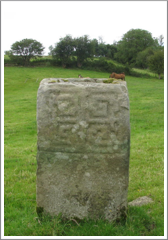 He identifies at least one of the figures on the left of the panel with a hound, an attribute of Cuchulain. (Porter, p. 15). This identification seems unlikely to me. The image is worn in such a way it is difficult to identify details that might assist with a more precise interpretation. The Arboe High Cross offers a consistent, logical and comprehensive set of images from both the Hebrew and Christian scriptures. The shaft on both the east and south faces offer scenes from the Hebrew scriptures. In each case the lowest image reflects fallen humanity: Adam and Eve knowing their nakedness on the east and Cain killing his brother Abel on the south. On the east face the other images reflect the salvation of God for those in need: God provides a substitute sacrifice for Isaac, Daniel is saved from the lions and the three children are protected from the fiery furnace. In addition the scene of the sacrifice of Isaac prefigures the saving power of Jesus’ death on the cross. The central two images on the south are part of the David Cycle and also reflect the saving power of God: David rescues a lamb from a lion and David saves his people by slaying Goliath. The only variance from the Hebrew scriptures appears on the south side of the cross in the upper panel. This scene is taken from the lives of the Desert Fathers. It represents God’s provision for the faithful: the raven bringing bread for Anthony and Paul. The shaft on both the west and north faces can be interpreted as outlining major events in the life of Jesus. On the west face we have the Adoration of the Magi, the miracles of Cana and the Loaves and Fish. On the north face we have, in this case moving from the top down to follow the chronology, the Annunciation to the Shepherds and or the Slaughter of the Innocents, Jesus before the Teachers and the Baptism of Jesus. These panels, taken together, and added to the images on the east and west faces of the head of the cross, offer images of the miracle of the birth of Jesus, his early life, the beginning of his ministry, his miracles, events from Passion Week and, depending on interpretation his Resurrection or Second Coming and Christ as Judge. As noted directly above, the west face of the head of the cross offers images of some aspect of Jesus’ Arrest and Trial and a depiction of the Crucifixion. On the east face we have what may be an image of the Resurrection or Second Coming in a panel below an image of the Last Judgment. Getting There: See Road Atlas page 11, A 4. The Cross is marked on the map. The cross is located south of the B73. Just past the Moortown Post Office take the Ardboe Road south. It will turn to the southeast and lead to the cross site. 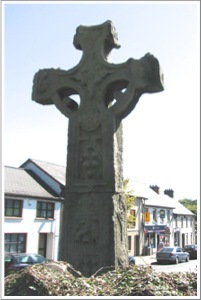 The cross at Caledon is a composite cross, composed of two parts. It is set up over Lady Jane’s Well in the grounds of Caledon Estate. 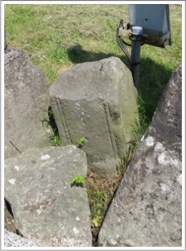 Shaft: The shaft stands 1.20m high. It tapers slightly from bottom to top and has a “box” at the top. “There is a circular device at the centre of the panel on each side.” (Harbison, 1992, p. 30) Only the device on the west is distinct. There is a central boss surrounded by eight circling and interlinked bosses. Head: The head was part of another cross. It is imperforate and the arms, which seem to have been broken, presently extend just beyond the ring. The cross is framed by a round moulding. On the west face in the center is a large boss. There may have been a flatter boss on the east face, but only traces now remain. Getting There: See Road Atlas page 18, G 2. 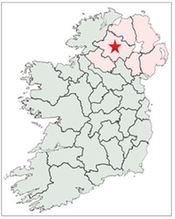 Caledon is located west of Armagh on the A 28. As noted above, the cross is on private property. Permission would be needed to view the cross. I have been unsuccessful in gaining permission to view this cross. The church there was rebuilt in 1041 and dedicated to the memory of St. Macartin. At the Synod of Rathbreasail, in 1111, Clogher was recognized as an episcopal see. The church was rebuilt again in 1295 by Matthew M’Catasaid, Bishop of Clogher. The church and more than 30 other buildings burned to the ground in 1396. Macartan’s hagiography states that he was born somewhere in Munster. Hearing of Patrick’s teaching he traveled to Armagh to hear him preach. He left behind a wife and child. He actually met Patrick first in County Leitrim. There he was baptized by Patrick and soon became Patrick’s “strong man”. It is said that when Patrick wore out Macartan supported him or carried him. Eventually, as he also grew older, he ask permission to settle down and live out his life in peace. The story goes that Patrick sent him to establish a monastery in Clogher. This tradition would support the rather later date for the foundation of Clogher monastery that Warner suggests above. 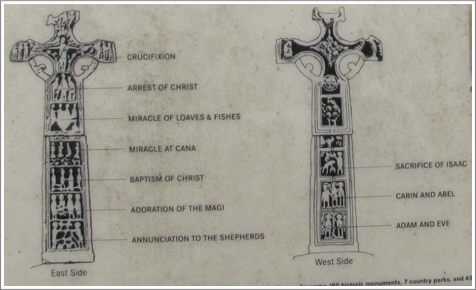 There are parts of five different crosses to the west of the Cathedral in Clogher. There are two composite crosses, each composed of separate shafts and heads. There is also a fragment of another cross on the ground between the two composite crosses. 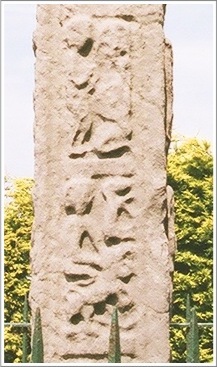 Base: The base of this cross is stepped near the top. East Shaft: Near the top of the shaft there is a area of interlace forming four circular devices. See photo to the right. West Shaft: There is a lozenge-shaped panel of interlace. See photo the the left. West Head: At the center is a roundel of interlace. 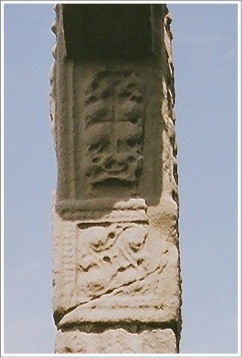 North and South Sides: The sides of the cross are undecorated. Base: The base is undecorated. East Shaft: The shaft is decorated with bosses of different sizes. See photo to the right. East Head: The top of the head is broken and missing. The upper part of the shaft at the bottom of the head has bosses that may have animal heads related to them. The head is imperforate and in the center is a boss with interlace. Three sections of the ring also seem to have interlace design. The forth, the lower right, is unclear. South Side Shaft: There is a panel of interlace. West Face Shaft: In the center of the shaft is interlace. See photo to the left. West Face Head: The section of the shaft below the head has interlace. There is a boss at the center of the head with loose interlace. The ring has fretwork on the lower right and interlace on the lower left. The upper right may also have interlace. This fragment appears to be part of the shaft of another cross. It is undecorated. Getting There: See Road Atlas page 18, E 1. 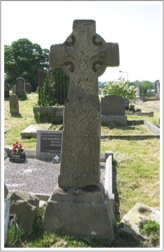 The crosses are located at St. Macartan’s Cathedral Church on the southwest side of Clogher. The Cathedral is located just to the southeast of the A 4. Very little is known about the monastery at Donaghmore. Some sources state that the monastery was founded by St. Patrick for St. Columb. Another source associates it with St. Patrick and St. Macerc. In each case the foundation was dated to the 6th century. 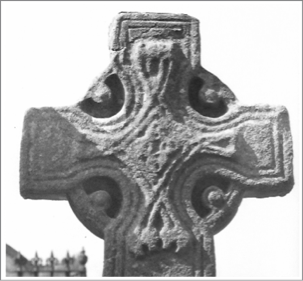 The cross is a composite of two original crosses. 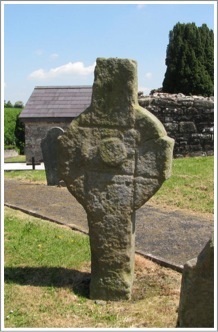 The cross is typically dated to the 10th century. It has been in its present location since 1776. East Face: See photo to the left. E 1: The Annunciation to the Shepherds. E 2: The Adoration of the Magi. E 3: The Baptism of Christ. E 4: The Marriage Feast of Cana. E 5: The Entry of Christ into Jerusalem. (?) Only a small fragment of the lower part of this panel survives. 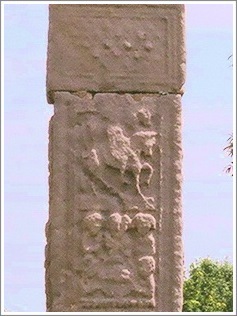 It is at the top of the lower section of the composite cross. E 6: Unidentified Scene. Only a small portion of a panel survives. 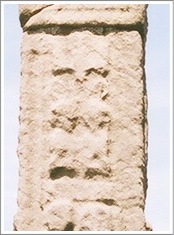 It is at the bottom of the upper section of the composite cross. E 7: The Multiplication of the Loaves and Fishes. E 8: The Mocking or Flagellation of Christ. Arms: Thieves held by guards. The image to the right appears on a sign posting at the site. Note there are some differences between the identifications of the scenes on the cross between those listed on the sign post and those identified by Harbison above. The primary difference is the identification of the panel just below the crucifixion as the Mocking or Flagellation of Christ (Harbison) and the Arrest of Christ (sign post). 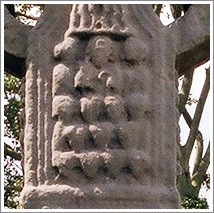 South Side: The lower shaft, near the bottom of the cross, may have an image of Romulus and Remus (?). Above are a lozenge-shaped pattern, a rounded one and another lozenge-shaped image. On the upper section is a lozenge-shaped figure with interlace under the ring. Two triangles with knots of interlace are under the arm. The end of the arm shows an animal facing down, its front paws beside the head. (Harbison, 1992, p. 66) See photo to the right for lower section. Base: A horseman facing to the right. There may be other animals on the upper step of the base. See photo below. The lower portion of the shaft is hidden by the cemetery wall. W 1: Adam and Eve knowing their nakedness. W 2: Cain Slays Abel. W 3: The Sacrifice of Isaac. West Head: An oblong figure from which four animal-heads seem to emerge. West Arms: Bears seated upright with long necks. Ring: Interlace that may be animal interlace. North Side: The design is similar to that on the south side. The animal at the base does not have any trace of figures beneath its body. Bosses in the roundel in the center are clearer. The animal at the end of the arm is less worn that on the south. See photo to the right. Getting There: See the Road Atlas page 10, G 5. The cross is marked on the map but not in its exact location. 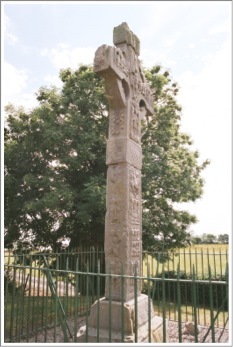 The cross is located on the B43 across from The Brewer’s House, where the Castlecaulfield road goes to the south. 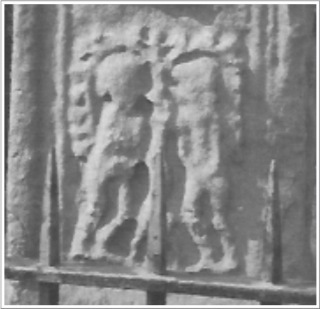 The photo above left shows the west face of the cross, the image to the right shows the east face. On the west there is a central boss in a frame created by incised lines. On the east face the outline of the cross and ring have been incised. The ring is imperforate. Getting there: See the Road Atlas page 18, E 1. The location of the cross is marked on the Road Atlas. The site is located on the map to the right south of Seskilgreen near the left edge of the map. 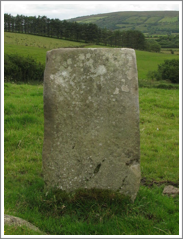 This decorated cross base (see photos left and right) is located “in a fence two fields down from a farm in Killoan townland.” (Harbison, 1992, p. 129) The Ordinance Survey has it marked as “The Head Stone”. The land owner, who accompanied me to the site, stated that he is prohibited from plowing in that field and that it is his understanding that there was at one time a monastic workshop there. Getting There: See the Road Atlas page 9, B 4. 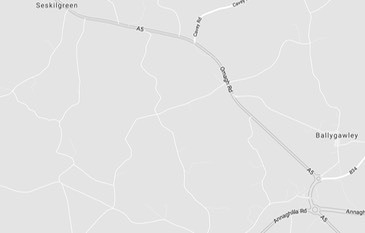 From the Langfield Primary School on the northwest side of Drumquin, take the Willmount Road west northwest till you come to the Tullard Road, that goes to the north. South of this intersection is a Horse Stable. The cross is located in a field south of the stables that can be reached by a farm road. The field is down a steep hill and is on the left. On the map below, the location is on the extreme left center of the map. 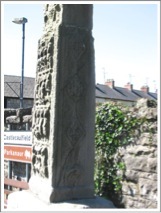 Bigger, Franacis Joseph and Fennell William J., “Ardboe, Co. Tyrone: Its Cross and Churches”, Ulster Journal of Archaeology, Second Series, Vol. 4, No. 1 (Oct., 1897), pp. 1-7. Colman of Arboe. parishofardboe.com. Parish History. 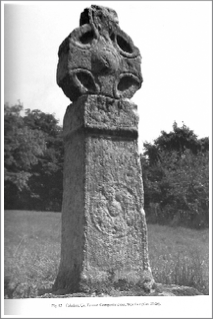 Foley, Claire, “Tyrone”, Archaeology Ireland, Vol. 3, No. 3 (Autumn, 1989), pp. 86-90. Photographic Survey, Dr. Rudolf Habelt GMBH, Bonn, 1992. Volume 1: Text, Volume 2: Photographic Survey; Volume 3: Illustrations of Comparative Iconography. Pringle, Alexander, Morris, H. and Patterson O.D. and T.G.F., “Correspondence”, Ulster Journal of Archaeology, Third Series, Vol. 2 (1939), pp. 292-295. Roe, Helen M., “Antiquities of the Archdiocese of Armagh: A Photographic Survey. 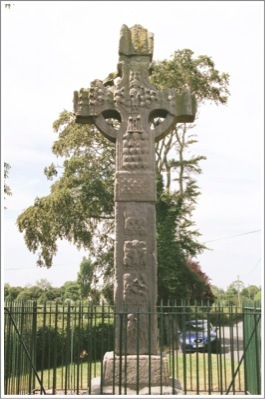 Part III The High Crosses of East Tyrone”, Seanchas Ardmhacha: Journal of the Armagh Diocesan Historical Society, Vol. 2, No. 1, 1956, pp. 79-89. Simson, W. J., “Note on the Parish of Errigal Keerogue, Co. Tyrone”, The Journal of the Royal Historical and Archaeological Association of Ireland, Fourth Series, Vol. 7, No. 61 (Jan., 1885), pp. 29-30. Ware, James, The Antiquities and History of Ireland, Dublin, 1705. Tyrone and Mid Ulster” in Dillon, C. and Jefferies H. (eds), Tyrone: History and Society, Dublin, 2000. pp. 39-54.